SpotMini, Boston Dynamics’s dog-like quadruped robot, is back, and it’s learned a new trick. The robot, which was unveiled in June 2016 and then updated in November 2017, can now open doors and hold them open. While opening a door is slightly old hat for a Boston Dynamics robot — Atlas barreled through a push-bar door two years ago — SpotMini’s operation is more eloquent. 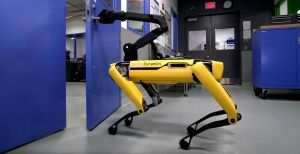 The robot uses its fifth appendage, an arm mounted essentially where a canine’s head would be, to swiftly assess the door, locate and twist the handle, and pull the door open. In a video released by Boston Dynamics, not only does the new-and-improved SpotMini open the door for itself, it even holds it open for its robot colleague. A portrait of professional collegiality, this is a big step up from the solo activities of washing dishes or rolling over. Boston Dynamics has made steady progress in their efforts to build robots that move in a life-like manner, whether it’s Atlas’ Homo sapiens-like saunter or SpotMini’s four-legged gallop. The same month they debuted their updated SpotMini, the company made headlines by releasing a video showing their Atlas robot’s back-flipping antics. The SpotMini’s latest development is confirmation that progress continues to march on behind Boston Dynamics’s doors. But while biomimetic robots are certainly useful — the ability to copy human motion enables these robots to dexterously manipulate objects and navigate complex terrain — they still inspire more fear than awe in many people. Outlets such as The Verge and Popular Mechanics have noted the similarities between SpotMini and the door-opening velociraptors of Jurassic Park splendor — not exactly a calming comparison, so if you envision these robots taking over the world, you’re not alone.